Rievaulx Abbey, Bow Bridge, Tylas Barn, Ashberry Farm and Rievaulx Bridge. Please note: this web page is updated every Thursday with a new walk. The Yorkshire Dales are covered with snow, and there's more on the way. Time to get your winter gear on and head out to the hills. Route: Cold Kirby, Flassen Dale, Scawton, Stocking House, Nettle Dale, Flassen Dale, Low Field Land. Highlights: Deep steep-sided valleys, a pub built by the monks of Rievaulx and countless pheasants. FREE Walking Weekend route pack. 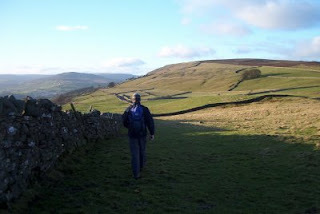 Buy any book from our on-line shop http://www.innway.co.uk/ and get a FREE walking weekend route pack. This walking weekend route pack will change on the first of every month, with 12 walking weekends to collect throughout the year. 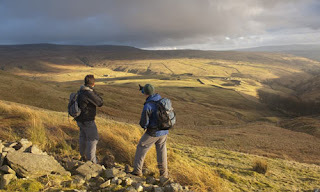 The walking weekend pack will contain two walks from a village in either the Yorkshire Dales, Peak District, North York Moors, North Pennines or Lake District. It will be sent as a PDF document via email. See our on-line shop for full details. My latest walking guidebook is now in the shops, after 18 months research and writing. This book features 24 circular walks from 12 villages, with a mountains walk and a low-level walk from each village - ideal for a weekend break. 5p from every copy sold will be donated to the 'Fix the Fells' appeal - and £75 has already been donated! The 'Fix the Fells' appeal raises money to help repair and maintain eroded upland paths in the Lake District, thus ensuring this beautiful landscape is passed on to future generations in good order.